HAMILTON — Laval Rouge et Or head coach Glen Constantin is running out of fingers for all of his Vanier Cup rings. Western's Greg Marshall, meanwhile, is still looking for his first U Sports football title as a head coach. They will lead powerhouse teams into what should be a dynamic matchup Saturday at Tim Hortons Field. Defending champion Laval is looking for a record 10th national title while Marshall hopes a long Vanier Cup drought will come to an end for Western, which can cap a perfect season with a victory. Constantin, who guided Laval to a 31-26 win over Calgary in last year's title game, knows his long-time friend and opposing coach is due. "It's just a matter of time," he said. "Just hopefully we can push it back another year." The championship game will be a homecoming for Marshall, who spent his formative years as a head coach at Hamilton's McMaster University from 1997-2003. He stayed in Steeltown for his first CFL head coaching job with the Tiger-Cats (2004-2006) before returning to his alma mater at Western. Marshall was a star running back for the Mustangs, winning the Hec Crighton Trophy as the country's top university football player in 1980. After a brief, injury-plagued CFL stint with the Edmonton Eskimos, Marshall turned to coaching in 1984 as an assistant to Western head coach Larry Haylor. The Mustangs won the Vanier Cup in '89 and took the national title again in '94, two years after Marshall was named offensive co-ordinator. Western reached to the final in '95 but lost to the Dinos in Toronto. The Mustangs fell to Laval in their last Vanier appearance in 2008. Constantin guided the Rouge et Or to a 44-21 victory that day in Hamilton. "When we (last) played here, he ran the ball (frequently that season) and then came out here and passed 68 times," Constantin said. "So you have to be careful. Sometimes a little knowledge is dangerous so we have to be careful with that stuff." Marshall's 2017 team has been strong in the air and on the ground. The 11-0 Mustangs have the top-ranked offence in the country — averaging a whopping 608.5 yards per game in the regular season — and have continued their dominance in the playoffs. The 10-1 Rouge et Or, meanwhile, have the stingiest defence with an average of 9.6 points allowed per game. Their lone defeat was a 21-16 decision to Montreal on Sept. 9. Laval has had stiffer challenges than Western in the post-season. After a 45-0 pasting of Sherbrooke in the Quebec conference semifinal, the Rouge et Or held off the Carabins 25-22 in the Dunsmore Cup before topping Calgary 35-23 in the Mitchell Bowl last weekend. Western was tested a couple times early this season but has not been threatened in recent weeks. The Mustangs are coming off an 81-3 whitewash of Acadia in the Uteck Bowl in their third straight playoff rout. "We've improved every single week and our run in the playoffs has been a continuation of that improvement throughout the season," Marshall said. Marshall's teams have been virtual mainstays in the Ontario playdowns during his run as Western head coach. The Mustangs reached the Yates Cup again last year but a fourth-quarter collapse proved costly in a 43-40 loss to Laurier. It was a result that left his squad hungry and motivated. "This team worked harder starting in December after last year's loss than any team I've ever been with before," Marshall said. Constantin was an assistant when Laval won its first national title in 1999, three years after the school's first official season on the gridiron. His first championship as head coach came in 2003 and he has won seven more titles since. Laval's only other meeting with Western was a 13-11 victory in the 2010 Uteck Bowl at Quebec City. The Rouge et Or also won three pre-season matchups over the Mustangs in 2007, '08 and '09. 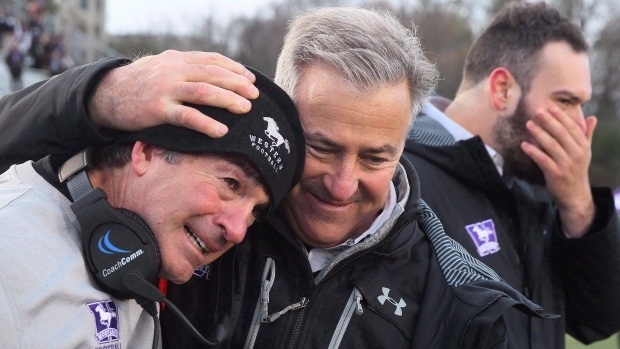 Laval leads all Canadian universities with nine Vanier Cup wins. Western is next with six, followed by UBC, Calgary and Queen's with four apiece.